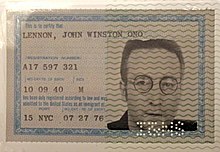 A 1976 card issued by the INS to singer John Lennon. Green Card or Permanent Resident Card is an identification card that proves that someone who is not a United States citizen is a permanent resident of the United States. The holder of the card is allowed to live, work and study in the United States on a permanent basis. Most people get Green Cards after being sponsored by a family member, such as a wife or husband, or by an employer that is located in the United States. Other people may become permanent residents through refugee or asylum programs, or similar programs designed to protect their human rights. In some cases, a person may be allowed to file for their own Green Card without a sponsor. After five years of legal permanent residency within the United States, the holder of the card is eligible to become a U.S. Citizen. ↑ 1.0 1.1 "Green Card". USCIS. U.S. Citizenship and Immigration Services. ↑ 2.0 2.1 Larson, Aaron. "The Green Card and Legal Permanent Residency". ExpertLaw.com. Retrieved 13 June 2017. This page was last changed on 22 March 2019, at 11:14.